Kryptowire will collect and securely transfer precise, calibrated, and context-aware sensor data from commercial off-the-shelf smartphones as part of DARPA’s Warfighter Analytics using Smartphones for Health (WASH) program. FAIRFAX, Va.--(BUSINESS WIRE)--Kryptowire announced that it has been awarded a $5.1 million contract by the Defense Advanced Research Projects Agency (DARPA) to develop an advanced system for passively collecting, aggregating, and managing smartphone sensor measurements in an effort to improve real-time warfighter health monitoring and predictive analytics for early disease biomarkers as part of DARPA’s Warfighter Analytics using Smartphones for Health (WASH) program. DARPA’s WASH program is an innovative approach to warfighter health analytics that leverages data collected from smartphone sensors to conduct passive, continuous, real-time assessment of physiological signals, to remotely monitor patient health, medication adherence, physical impairment, and early detection of the onset of disease. Kryptowire intends to develop a secure, privacy-preserving, and context-aware solution to provide the medical research community data collected from users’ smartphones during both everyday use and during clinical trials to improve health services, health research, and health outcomes. Kryptowire’s research plans to combine application and Mobile Device Management (MDM) approaches to enable data collection across all major vendors for iOS and Android smartphones. The approach should offer ease of deployment at scale, data anonymization, secure access control to device data, and transparent data collection. In addition, Kryptowire’s existing collaboration with Qualcomm enables it to achieve a significant reduction in power usage for the sensing, security, storage, and transmission of smartphone data. Kryptowire intends to provide access to the technology to several existing cohort studies that bring extensive historical ground truth data that can be leveraged to further extend the longitudinal period from which to validate both existing and newly developed symptoms and diagnoses. This provides important context to ensure the clinical relevance of new data collected, and to increase its practical use. Kryptowire automatically tests and validates the security of mobile and Internet of Things (IoT) firmware and applications to the highest government and industry software assurance standards. Kryptowire is based in Fairfax, Virginia, USA and has a customer base ranging from government agencies to national cable TV companies. 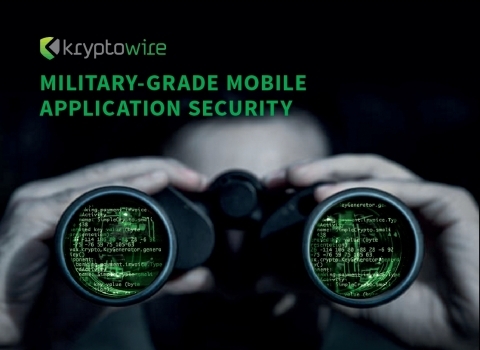 For more information and to schedule a demo, visit www.kryptowire.com. Kryptowire awarded $5.1M by DARPA to deploy an advanced mHealth solution for the remote detection of physical impairments and the onset of disease.